SUNSPOT - Sunspot Observatory was closed and evacuated Sept. 6 due to an undisclosed security risk. Officials aren't saying why it was closed and that's led to media coverage and plenty of speculation. “Nothing’s changed from last week,” Association of Universities for Research in Astronomy, or AURA, spokeswoman Shari Lifson said by phone Thursday afternoon. Lifson offered no further information. 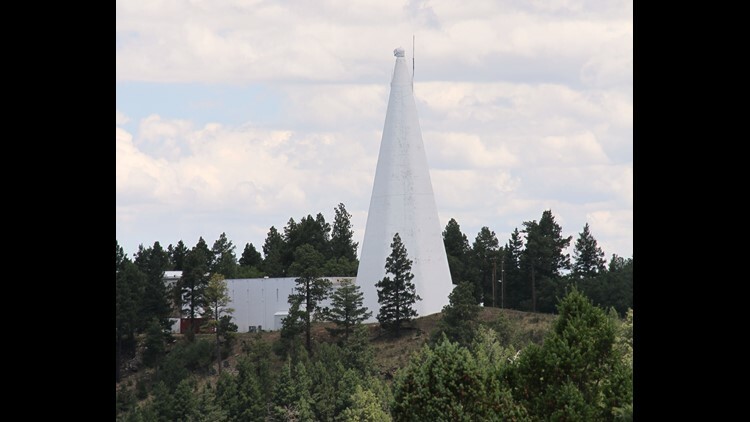 The Sunpspot facility is a part of the National Solar Observatory and AURA maintains it. McAteer is a professor of astronomy at New Mexico State University in Las Cruces, about an hour and a half to the west of the observatory. The observatory is located high in Sacramento Mountains. The closest city is Alamogordo, at the base of the Sacramentos — about 15 miles as the crow flies, but nearly an hour's drive time away. The Sunspot Solar Observatory is run by a consortium of universities that provide funding to operate the telescope and adjoining visitor’s center, McAteer said. “Those are the two building where we have our employees at in Sunspot: the telescope and the visitor’s center,” McAteer said. Which means that they are responsible for the guided tours and scientific data, he said. NMSU's four employees at Sunspot were evacuated Sept. 6, as were five or six employees of AURA. The U.S. Postal Service, which operates the Sunspot Post Office, evacuated its employees, though McAteer said he did not know how many people worked at the facility. There were also about 12 to 15 residents who were evacuated, McAteer said. “The whole site was evacuated,” McAteer said. The Richard B. Dunn Solar Telescope, that McAteer and his team operate, rotates on a mercury float bearing at the top of the tower. "On Thursday Sept 6, AURA made the decision to temporarily close Sunspot. The Sunspot Solar Observatory continues to work closely with AURA in order to allow for us to reopen as soon as possible. With the excitement this closure has generated, we hope you will come and visit us when we do reopen, and see for yourself the services we provide for science and public outreach in heliophysics. If you have any questions about the science we perform at the telescope, or about the outreach we provide through our Visitors Center, please contact our Director, Dr McAteer at mcateer@nmsu.edu".